I should begin by saying that the health issues I’ll conclude with in today’s post are very, very uncommon. Which is a good thing, because they really are the worst that can happen: Tetanus, MRSA, hepatitis and HIV. All of them come from unclean conditions and a lack of proper precautions. While no one can guarantee 100% that you won’t end up with serious health problems from getting tattooed, starting out with a reputable artist and making sure you take care of the tattoo properly afterwards can put you pretty close to that hundred percent. If you’re getting a homebrew, gang, or prison tattoo… you’re on your own. It never dawned on me that one should be sure to have an up-to-date tetanus shot before getting a tattoo. As it happened, I had gotten one only a few years before (they are supposed to be good for ten years) so I was not at risk. But if you don’t know when your last shot was, or don’t know if you’ve ever actually had one–time to check with your doctor. People who are my age (born in the 1950s) might or might not have gotten immunized as children. People younger than that most likely got the full series of immunizations–but they have to be kept up to date and booster shots given every ten years or so for the immunity to remain strong. Getting a shot might be inconvenient, but getting tetanus is far, far worse. You don’t have to step on a rusty nail to get it. Here is the official FDA page that talks about tetanus and how to prevent it. MRSA is the abbreviation for “methicillin/oxacillin-resistant Staphylococcus aureus.” While Staphylococcus bacteria have probably been around for longer than humans have, it’s only in recent years that the antibiotic-resistant form has become common enough to be a serious health concern. It got its start in hospitals, and the most common place to get infected by it remains health-care facilities, but that doesn’t mean someone who isn’t in a hospital or nursing home can think they’re home free. “Staph” bacteria are everywhere–you’re probably carrying billions of them around right now even though you are perfectly healthy, and you may even have the MRSA variant without knowing it. It isn’t till they get into your body through a wound of some kind that they can cause problems. And guess what a tattoo is? All kinds of staph infections produce small red bumps that can quickly turn to deep abscesses. It goes without saying that if you see anything like that, run, do not walk, to get medical attention. You don’t want to take chances with your life, because make no mistake about it, MRSA can kill you. Ask your doctor to test the wound for the presence of MRSA before prescribing treatment. Ordinary antibiotics that are used to treat staph won’t help and can make the problem far worse. Here is a good, clearly written article from the Mayo Clinic that should give you an idea of what MRSA is all about. Hepatitis comes in several variants, but the one most commonly transmitted through unclean needles is Hepatitis B. Again, if your artist uses proper sterilization procedures and the shop is kept clean, your chances of getting Hep B are pretty close to zero. However, again, since you have an open wound, contact with other people might be a problem, the more so because something like 30% of Hep B carriers have no symptoms of the disease themselves. While there is a vaccine available, many people have never been vaccinated and are thus at risk of infection. Treatment is available, but far better never to contract the disease in the first place. If you haven’t gotten the Hep B vaccine, ask your doctor about it. You will have to wait before getting your tattoo, to allow the vaccine to become effective. Here is a fact sheet from the CDC about Hepatitis B. The good news is that according to everything I’ve read, there has never been a reported case of HIV being spread by a tattoo parlor in the USA. Again, if you’re letting someone other than a tattoo artist in a tattoo shop where proper sterilization is practiced have his or her way with your skin, what happens to you after that is up for grabs. They may tell you it’s perfectly fine to just wipe things down with alcohol or boil them for a few minutes. Don’t fall for that. It’s obviously also not perfectly fine to just put ink on your skin and have at it with a sharp instrument. It doesn’t matter how many of those National Geographic shows you’ve seen about some teenager out in the jungle getting who-knows-what cut or punched into his or her body with no apparent concern for germs or disease, and living to tell the tale just like the people who are punching the ink or cutting the skin. You don’t have to prove yourself that way. 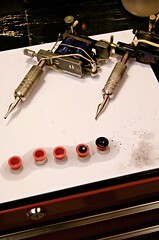 Getting a homebrew tattoo may be inexpensive; the real cost may be your life. Here is what the CDC has to say about the risks of HIV from tattooing. Avoiding health problems when you get tattooed is mostly a matter of simple common sense. Spend a little time checking things out. Don’t take risks with your newly inked skin. Keep yourself and your surroundings clean during the healing process. Make sure your immunizations are up to date. A little time spent on things like that can keep you safe from a lifetime of misery. Doesn’t it make sense to just take care? Starting next message, I’ll talk about happier subjects. Lawyer: Ask your friends, check out local artists’ web sites, and if you see someone with great ink, ask them where they got it. You don’t want to cheap out on something that will be with you for the rest of your life. @Johnny007 — If you go to a reputable tattoo parlor, the chances of any nasty aftermath are very low. The artists keep everything sterile and will take all possible precautions. Scarring is something else entirely–by design, it damages the skin beyond repair. And it’s just that much easier to get a nasty infection if you aren’t incredibly careful with the wounds after you get them. Those symptoms sound serious enough that I’d suggest you see a doctor as soon as possible. What you’re experiencing may or may not be related to the tattoo, but it’s best to have a doctor sort it out.